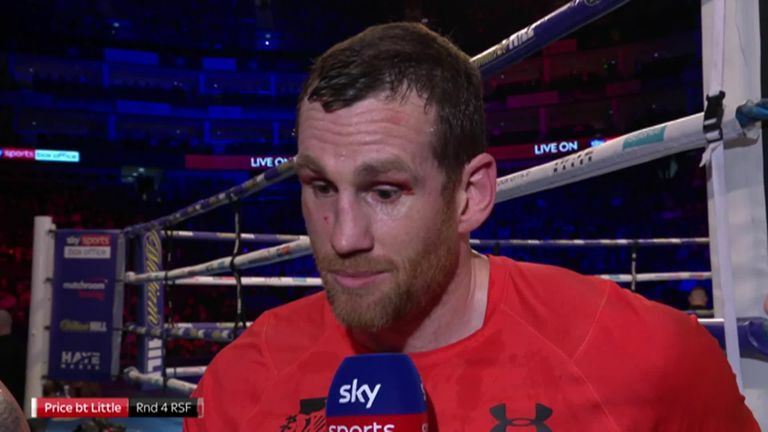 David Price stopped Tom Little on his feet in their heavyweight fight at The O2, but Little complained about the decision afterwards. Price had Little wobbling in the fourth round after a stinging series of shots when referee Kieran McCann jumped in to end the fight. Little shouted "no, no" immediately afterwards as Price peeled away in celebration. "I didn't want to see him in a heap on the floor," Price said. "I fear for him, because he's a fighting man and he didn't want to get stopped in that fight." Little responded: "At least give me that chance, I've worked hard as well as David worked hard. "I'm heartbroken. I would love nothing more than to do it again." The victory saw Price return to winning ways after back-to-back defeats - he was knocked out by Alexander Povetkin before retiring through injury against Sergey Kuzmin. Little was the first to begin throwing haymakers in an attempt to bully the taller and rangier Price. Price's right hand, usually his most powerful punch, was absent until the third round when it left its mark. Price ended that round strongly. When Price next scored with his right hand, towards the end of the fourth, he staggered Little backwards and the referee called a halt.